While I love fresh, raw salsa, there’s something magical that happens with the combination of roasted tomatoes and fresh ingredients. Plus, the body absorbs more of the beneficial nutrients in tomatoes when they’re cooked first. Preheat oven to 325°F. Line a baking sheet with parchment paper. Toss cherry tomatoes with coconut oil and a sprinkle of sea salt. Roast for 15 minutes. While cherry tomatoes roast, mix together onion, cilantro, garlic, jalapeño, lime juice, and sea salt in a medium bowl. Once tomatoes have cooled, pull off the tomato skins, chop the tomatoes and fold into the fresh ingredients. Taste and add more salt or lime juice if necessary. psst! Change it up: use tomatillos to replace tomatoes for a tasty roasted green version of this salsa. Use 2 large tomatoes if you can’t find cherry tomatoes. 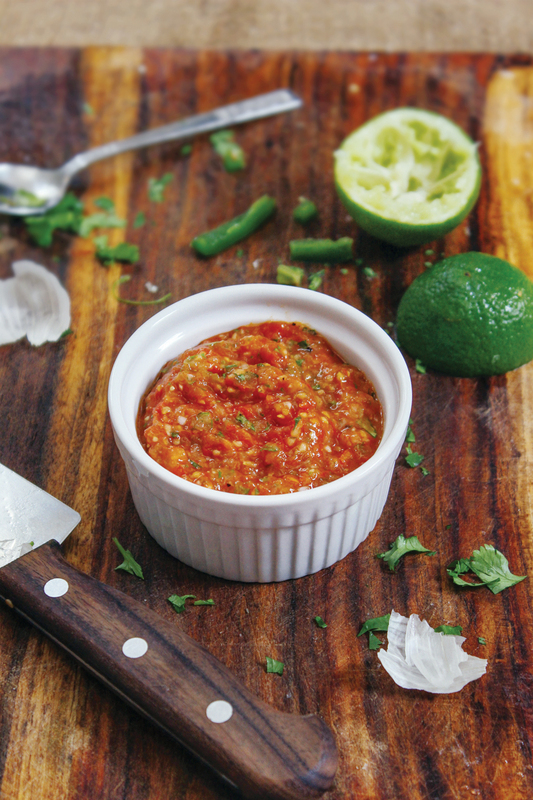 Skip the roasting for a raw salsa.